Located in the East Village, Stuyvesant Town is something totally unique in Manhattan… oversized, renovated apartments set within an 80-acre private park, featuring an abundance of activities, amenities and services. From the hundreds of social events, seasonal greenmarket, live music, movies, and food fairs, there is always something going on at Stuyvesant Town! Oversized is perhaps a bit of an overstatement, but perhaps not for NYC. It is also large enough to be recognizable on the aerial maps, which is helpful for when I am trying to figure where all things fit together. 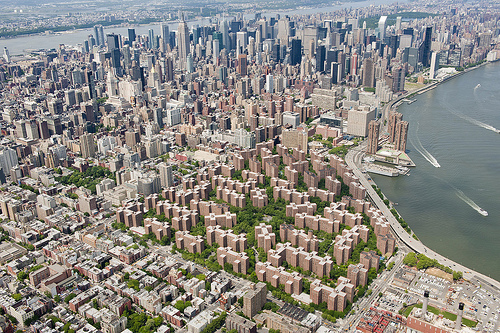 Stuy town from the air. Ashlan’s Apt is near 14th and Avenue B (for those that know NYC, near the right side of the photo. Ashlan was a bit hazy on the history, so I consulted Wikipedia. In brief, a post World War II housing complex. Located on what had once (in the 17th century) been the 80-acre farm of Peter Stuyvesant, the last Director-General of New Amsterdam. The area was part of the Gas House District in the early 1900’s and home to large gas tanks. 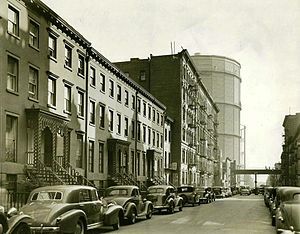 Stuyvesant Town was built after World War II as a public-private partnership between Met-Life and NYC. The early history of the complex include discrimination and lawsuits regarding condemnation of land, and whether private companies should profit from “public benefit” takings of land. (It seems that on that subject not much has changed over the past 70 years.) The lawsuits continue, or at least until recently. In the present it has afforded Ashlan an almost affordable reasonable place to live. She started her adventure in a Brooklyn apartment. A bit less expensive, but considerably further from work and play. This entry was posted on September 24, 2012 at 8:33 am and is filed under Uncategorized. You can follow any responses to this entry through the RSS 2.0 feed. You can skip to the end and leave a response. Pinging is currently not allowed.